President Barack Obama thinks right now is the greatest time to be alive. At least that’s what he wrote in his guest editorial for this month’s edition of WIRED — a science and technology magazine — and reiterated in a speech on Carnegie Mellon University’s campus Thursday afternoon. At the conference, the longtime “Star Trek” fanatic took the stage to confess that he was a “science geek” and proud of it. The desire to imagine, hypothesize, test and tinker is what makes this country special, Obama said. The Frontiers Conference, a one-day event hosted by University of Pittsburgh, CMU and the Obama administration, hosted a litany of science, technology, business and innovation speakers, including the deputy administrator of NASA, the engineering lead for Uber and Pfizer’s chief medical officer. Officials from the White House slotted the conference for Pittsburgh because of the city’s burgeoning tech scene, which has brought Google, Uber and a range of startups into the area in recent years. In exhibits at both Pitt and CMU, Obama and other attendees got to test out new innovations, from a space capsule to an unmanned quad-copter to a paper microscope. The idea of innovation, Obama said, isn’t new to Pittsburgh. Tim O’Reilly, founder and CEO of O’Reilly Media, opened the plenary session that Obama attended with a discussion of what he said is the next natural step in technology — artificial intelligence. Through artificial intelligence — which includes designs like self-driving cars and computer programs that can respond to humans — he said, people will be able to solve the “big problems” that go beyond human capacity, like sequencing a genome quickly and efficiently. In preparing for the future, the President said it was important to not only focus on innovation, but also the people driving that innovation. “We realized we can’t look to the future if we’re also not going to lift up the generation that’s going to occupy that future,” Obama said. Throughout his time in office, Obama has sought to draw attention to the importance of educating a broad spectrum of young people, from different socioeconomic backgrounds, in science, engineering, technology and mathematics through programs such as the White House Science Fair. Earlier in the plenary session, Roman Mars, the founder and host of “99 Percent Invisible,” a podcast that focuses on architecture and design, conducted a live podcast with Stanford professor Raj Chetty about how demographics affect success in innovation. Chetty’s research found that being around innovation increases the likelihood of innovation and segregation correlates strongly with differences in opportunities. In one of his studies, Chetty and his colleagues found that a third grader’s math scores predicted that student’s likelihood of becoming an inventor. Those children with a high socioeconomic status were even more likely to receive a patent in their lifetime. “You need two things in order to be an inventor — you need to be smart … and you need to be from a high-income family,” Chetty said. To improve this landscape, Chetty is looking for a way to bridge the gap created by systemic inequalities. Making the opportunity to study STEM available to everyone is an important step moving forward, Obama said. In his speech Thursday, which focused largely on Pitt and other universities, Chancellor Patrick Gallagher said that at the heart of every innovation was a “human spark,” and it was the responsibility of current leaders to nurture and foster that spark. “Today’s pioneers are at the very horizons of humanity. [They are] looking at the entire universe as they question the status quo, disrupt the limits of today and define our future,” Gallagher said. 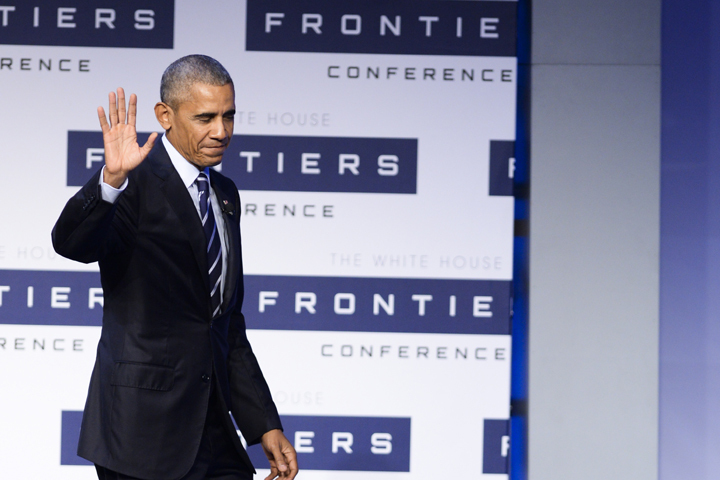 As his presidential tenure comes to a close, Obama warned that innovation should not be done away with “when we’re tightening our belts.” Instead, he said scientific and technological advancements should remain at the forefront of the agenda, with facts, data and science leading the way to solving some of the country’s biggest problems.